On Thursday night, I sat down to write my post. I had a great idea and began to type. A paragraph in, however, and I just didn’t know where to go with this concept. No problems, though, unlike some other days when I struggled to come up with one idea, I had another idea at the ready. So I saved my first idea as a draft (to be completed when I could) and began work on my second idea. Unfortunately, this too quickly descended into a mire from which the post refused to budge. So there I was two ideas down and no more topics were coming to mind. The night began to drag on, I couldn’t come up with anything else, and my already blog-topic-empty brain began to fight drowsiness too. At this point, I decided to just skip the blog post. Sometimes it is better to not write anything at all when you don’t have anything to write. Over the weekend, I began to think about why I couldn’t think of anything. Why did those perfectly good topics lead to no words springing to mind? Why could my brain not think of anything else. In one word: Routine. I’ve settled into a routine. Nearly every day is the same. I get up, go to work, come home, make dinner, clean up from dinner, get the boys ready for bed, get the boys in bed, write a blog post, and go to sleep. Sure, the details might change from day to day, but the overall schedule is the same. And if there’s one thing that kills off all inspiration, it’s going through the same routine day after day. I’ve gone through similar slumps in the past. In every case, I broke my slump by doing something outside of my normal routine. Playing Munchkin with NHL, running alongside JSL as he bikes, taking the boys to a museum, going on a walk by myself. As long as it varies from my usual, daily activities, it can help get the creative juices flowing. What helps to inspire you when you get into a creative rut? 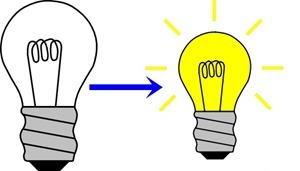 NOTE: The "light bulb off => on" image above is a combination of "Light Bulb Off" and "Light Bulb On" by palomaironique which is available via OpenClipArt.org. I always find that even if what I am writing and the topic gets away from myself, I keep writing. Even if it at times it doesn’t make sense I keep writing. Then let it set for a couple days and come back to fine tune it all. Sometimes even if you don’t have the inspiration that is where some of your best work can come from.